As a Insights user, I would like to be able to see our APM deployment markers in our insights dashboards so that we can have a way of seeing code base changes and how that is affecting our new insights data. Ideally, we could apply the deployment markers for an application across all of our timeseries charts within a particular dashboard. 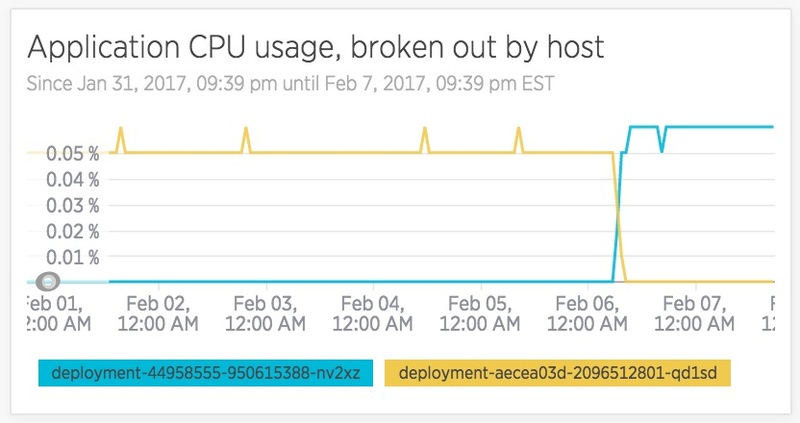 Deployment marker/info from APM to link to Insights? Hi @kvincent - Having the option to view deployment markers across TIMESERIES queries would be a useful feature. Hopefully one of the community moderators will convert this to a feature request poll. Hey there @kvincent — Thanks for letting us know! I have added a poll so please vote! I will also be passing your ideas and input along to our Insights Product Manager. Thanks again! Nothing to share right now, @isyndicate! Be sure to vote in the poll above and add your use case for our Product team’s review. This would be great for us too. We would also like to be able to compare specific builds using the deployment markers. For example, we have a fast moving development model and sometimes do multiple releases in a day, so being able to compare performance between different non-consecutive deployments would allow us to see how particular builds have changed the performance. Great use case, @joshua.wraight - thank you for letting us know you would like to see this as well. Check back again soon! Any updates? Would be great to have. No news to share right now, @f.fu! Thanks for checking in—be sure to vote in our poll at the top of this thread. If you have a different use case to add to the mix, please feel free to also reply here with it so our Product Manager can see. Thanks! Linds, please, this is still not possible? Hey @spetran - Still no news right now - It’s definitely a feature idea our Insights team are aware of. I’m sure you can understand that roadmaps are constantly evolving and requests need to be prioritised. Getting more and more use cases added to the feature request can help it gain traction with the product team though. We’ll get your +1 added for that. Would be great to be able to use Deployment Markers in Insights. Added my +1. We are trying to form dashboards with frontend apdex score (time to dom interactive), and backend apdex score (web app duration), and would be very good if we were to display the scores for each deployments. Currently the only way is to make a custom attribute facet of deploy version and making deploy marker to trigger to create data under the ‘version facet’. Hey @esong01 - thanks for your additional input, I’ll get that added to our Feature Request internally. Hello, our internal product management teams would like to be able to see deployment markers in all the charts on our Insights Data Apps to track performance and errors after releases. I am having trouble selling the value of adding deployment markers and other instrumentation for the deployment process without the ability to do this. Is this something that has been prioritized for the near term? I’m trying to decide if I should try to find a workaround with a custom insights event.